The 2017 operator class started on March 4th at 10 AM. 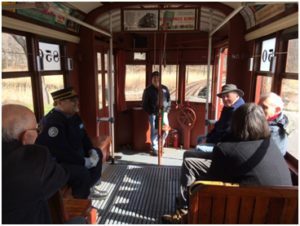 This year’s class includes 12 students that will learn how to operate a trolley car and about the history of the museum and its cars. The course work includes a lot of handle time, as these students experienced on their first day of class. Over the next four weeks the students will learn about: brake operation, electric signals, history of the museum, review of rule book, track switches and overhead line, emergency stopping, shop and yard procedures, taking out and putting away cars, giving tours and ending with a final exam. In addition to learning they will be experiencing operations by operating a number of different cars at the museum.